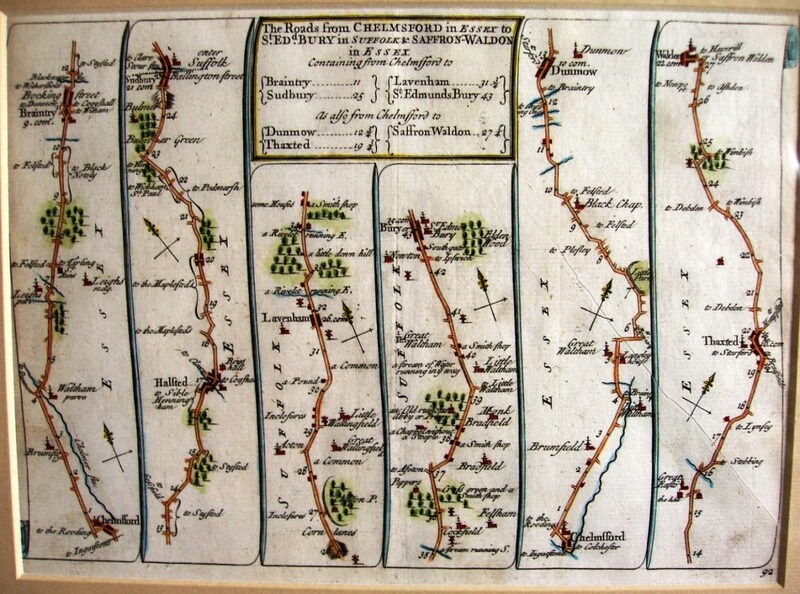 These were a method of showing routes across England & Wales, characterised by using a set of short, narrow maps showing the road and its side-tunings. A printed page would have many strips, with the top of the first strip being continued at the bottom of the second strip, etc. To show how they slowly changed, I have shown the strip showing the same place from each of the mapmaker’s publications. About 100 years after the first county maps by Christopher Saxton, John Ogilby created the first (and it turned out only) volume of Britannia. There are 100 plates showing roads, split into Direct Independents (the major roads from London), Direct Dependents (major roads starting on a Direct Dependent), Cross Independents (major cross-routes) and Accidentals (other notable roads), plus 200 pages of description – all at a consistent 1 inch to a statute mile (ie 1,760 yards, c.1,600 meters) scale, or 1:63,360. There is a dot for each furlong (220 yards, c.200 meters), plus at each mile the number of miles from the road’s start. Significant side roads are shown along the routes, plus buildings and other features close by the roads. The routes shown can be viewed as very reliable depictions of actual roads. However, it was a very bulky book, frankly more of a “coffee table” book than a guide to take with you, perhaps of use that you could take imaginary journeys around the country whilst sitting at home, or perhaps to impress your friends with your level of knowledge of the country. Forty years after Ogilby’s ground-breaking but heavy work, more booksellers decided to create copies of the maps at a smaller scale, that, together with omitting Ogilby’s lengthy descriptive texts, meant that they could create much lighter books that could be taken in a horseman’s pocket, let alone in a carriage. The first was Thomas Gardner. This was a straight copy of the Ogilby plates, including a dot every furlong (unlike on Senex); this is the same map as shown for Ogilby, this time with a “92” in the bottom right corner. The maps are printed on one side only. The title panel is the same design as in Ogilby (unlike Senex), with the addition of dedications on some sheets – eg to Thomas Western Esq on plate 92. The roads, houses and towns are near enough exact copies of Ogilby, and whilst the hills use smaller symbols there are almost as many trees shown. The shading at the end of each scroll is less pronounced than on Ogilby, so it is far easier to read (eg compare Chelmsford in the bottom left). Another straight copy of Ogilby’s 100 plates, but with only a dot per mile marker (instead of a dot every furlong as shown by Ogilby and Gardner). This is the same map as shown for Ogilby and Gardner, again with a “92” in the bottom right corner. The maps are printed on one side only. The roads, houses and towns look the same as on Ogilby, but there are fewer symbols for hills and woods. There were four editions of his book in 1719 (with slightly varying titles), and then a “Second Edition” in 1742 issued by his wife Mary (shown as M Senex) with maps printed double sided and plate numbers both left and right at the top. She also issued a “Third Edition” in 1743 and a “Fourth Edition” in 1748. John Bowles republished the work in 1757 (printed double sided, with numbers top left and right) with some changes to the plate numbering and with added notes. Further editions of this version were issued in 1762, 1768, 1780 and 1792. 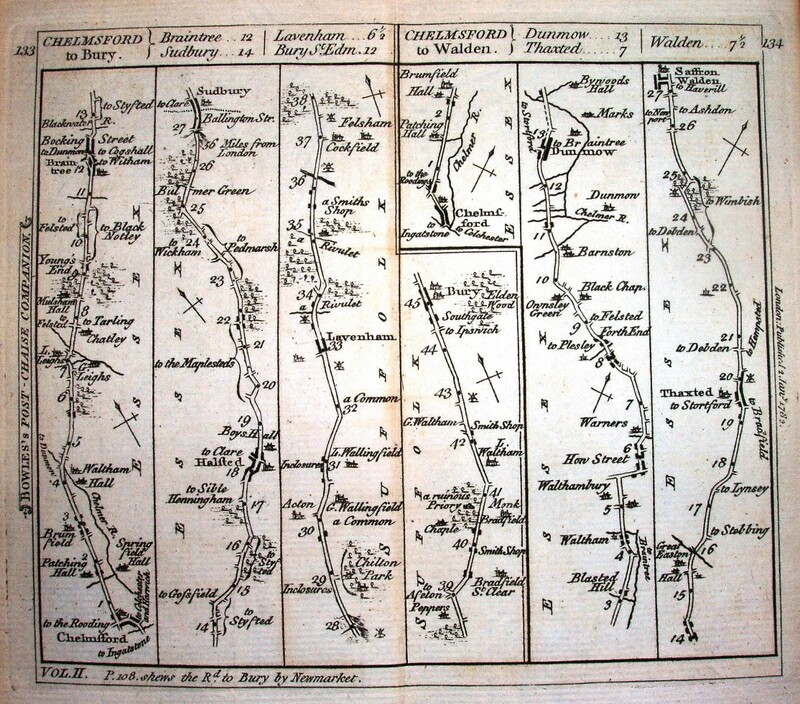 The Senex maps were also copied for St George’s French edition in 1759, for Kitchin’s Post-Chaise Companion in 1767 and Jefferys Itinerary in 1775; and possibly also some 39 of them in The Universal Magazine in 1765 to 1773. The scale is about 2.22 miles to an inch (instead of Ogilby’s 1 mile to an inch), or 1:140,000 (the same as Gardner). 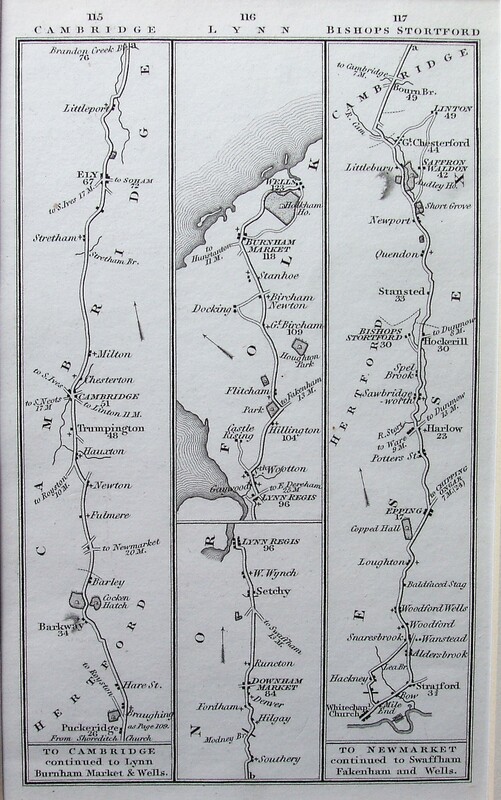 The road maps have been directly copied from Ogilby’s Britannia, but on separate pages, with only 3 or 4 strips to a page and a separate number for each page. 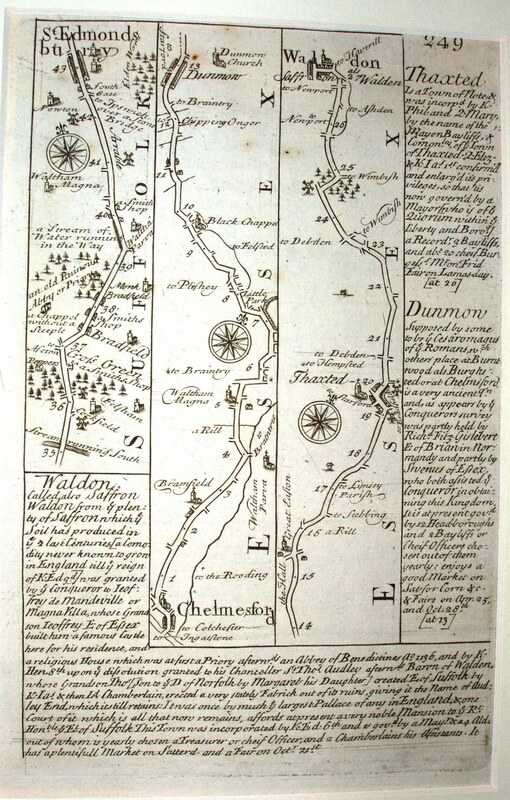 Page 249 shows the road from Chelmsford to Saffron Walden, the same as the right-hand side of the Ogilby, Gardner and Senex plate 92s. The strips are of varies length, as around them are inserted a lot of information about the towns you pass through. You also get maps of each county (based on Morden’s maps), plus general county information. The scale is about 2.12 miles to an inch , or 1:134,000 (fractionally larger than Senex and Gardner). Britannia Depicta was very successful, being re-published 3 times in 1720 alone, plus at least 3 more times without changes up to 1736, and then in 1753 with some changes in details on some plates, and with further minor changes in 1759 and in Carrington Bowles’ edition of 1764. The full Britannia Depicta is not very large in area, but is about 29mm thick, as it has around 280 pages. It is far, far more portable than the original Ogilby, and has far more information than the Gardner and Senex copies – factors that no doubt contributed to its long life. 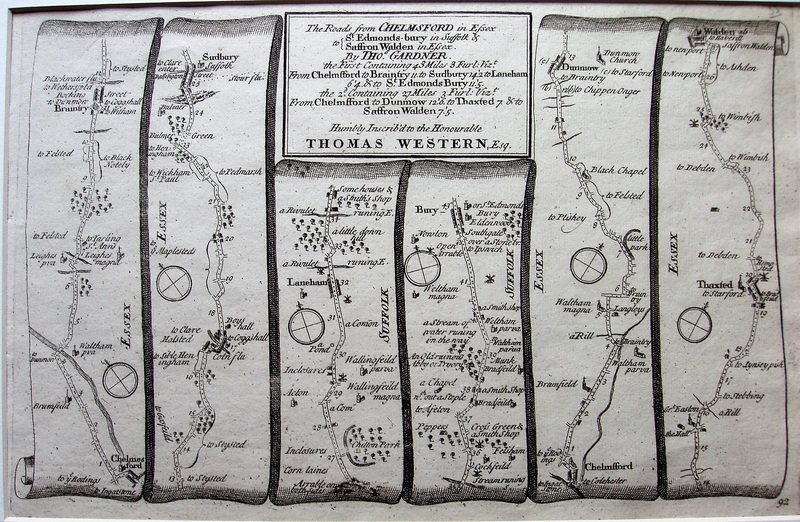 Mainly the same maps as the original Senex 1719, ie a straight copy of Ogilby’s 100 plates, but now published by John Bowles with the maps printed double sided and some of the page numbers have been changed; page numbers are now printed top left and top right – the above is now plate 68 (with plate 69 on its reverse). In some cases there are notes about where other roads from the towns on the current map are also to be found on other maps. Scale is about 2.22 miles to an inch (being a copy of Senex), or 1:140,000. More maps based on Senex 1719, but this time they have been copied from a French version in 1759, with a translation back to English and some changes to the maps. The strips are all thinner (& a little taller), but there are very few differences in the roads, houses and towns (Chelmsford has lost its church). 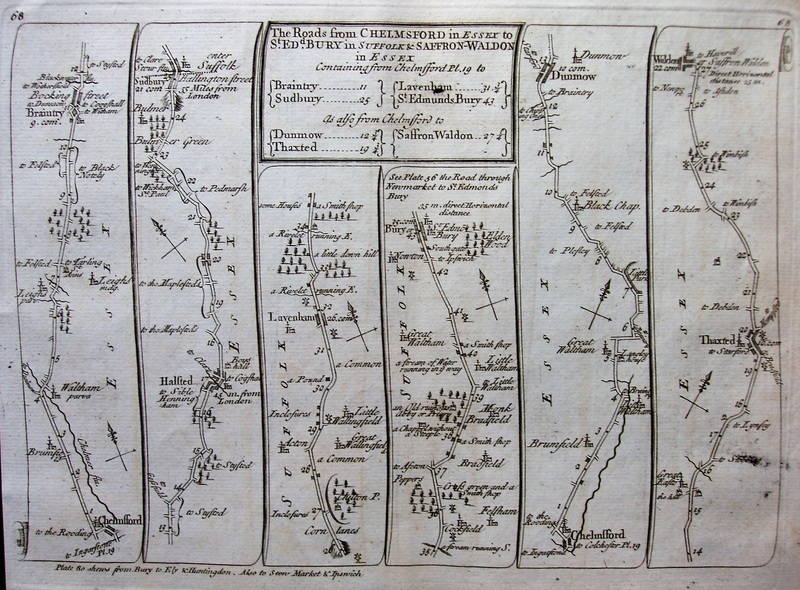 The maps are printed double sided and have retained their page numbers top left and top right – the above is now plate 68 (with plate 67 on its reverse; cf Senex 1757). Despite the similar titles, this is not a reissue of Kitchin’s Post-Chaise Companion, but rather a new Bowles publication albeit using Kitchin’s plates from his Ogilby’s Survey Improved or Kitchin’s New and Instructive Travellers’ Companion of 1771 that Bowles had purchased in 1780. 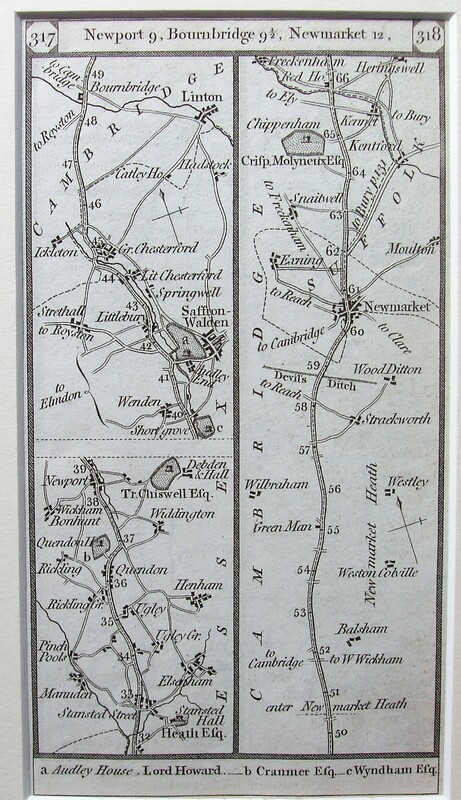 The strip maps were retained, but the titles were changed and distances between towns added (and North pointers). The page numbers have changed (above is pages 133 & 134), and there is a Volume number at the foot of the page plus “Bowles’s Post-Chaise Companion” (in capitals) down one side of the sheet and “London: Published 2 Jany 1782.” on the other. Scale of about 2.75 miles to an inch (smaller scale than the Gardner, Senex & Bowen versions), or 1:175,000. A two volume work by the “Assistant to the Quarter Master General of His Majesty’s Forces”, first published 3 January 1785, and reissued in 1796, 1800, 1803 & 1807. The 1785 maps have across the bottom of each sheet “Printed for the Proprietor Carington Bowles London 3 Jan 1785”. The 1796 maps have “Printed for the Proprietors Bowles & Carver, London 7 Jan 1796”. The 1800 and later maps have “Printed for the Proprietors Bowles & Carver London”. The scale is about 3.0 miles to an inch, or 1:190,000. A smaller pocket book than the earlier works, with three strips to a page (printed single-sided), plus listings of mail coach routes, Direct Roads and principal hills. Each strip is numbered, and titled with the main town along that stretch of road. There were reissues of the Companion in 1827, 1830, 1833 & 1835. There are no furlong markers or even mile markers; distances are noted alongside major places along the roads. No roads other than the one being followed are shown (unlike in Paterson). The scale is about 8.7 miles to an inch, or 1:550,000.